SCA Members learn more about invasive/noxious species in our bi-annual newsletter, Sightlines. Periodically, we’ll share these updates on our website as well. If you have a species you’d like to know more about, please email us at SCA@SCAWILD.ORG and we’ll consider it for an upcoming newsletter. Many people view spotted knapweed (Centaurea stoebe) as a pretty purple wildflower. It is rather, a heinous noxious weed. It grows to the preclusion of desirable vegetation that wildlife and farmers depend upon for their livelihoods and it diminishes soil and water quality. Spotted knapweed is a short-lived perennial, about 20 years, starting its first year as a rosette. In the ensuing years, it sends up multiple branched stems with flower-heads on the end. A member of the composite family, the seed-heads are composed of discoid flowers, pink to lavender, sometimes white in color, with falsely sub-radiate corolla and those along the edge being enlarged. Knapweed species are identified by the involucre bracts that hold the flowers. The bracts on spotted knapweed are triangular with a short fringe along the upper edges and a black or darkened tip. Seeds are large and heavy. The fringe that rings them is not designed to carry them on the wind, it serves to orient the seed and move it into the ground. Each mature plant is capable of producing in excess of 25,000 seeds that at last count, can survive 20 years in the soil. What changes to our forest does the ubiquitous spotted knapweed bring? It readily invades into the forest along roads, slowly encroaching into the surrounding openings, even into areas with healthy native cover of grasses and forbs. It does not readily invade under a closed forest canopy as it is somewhat light limited, although it will invade under a partial canopy. While knapweed can increase erosion and decrease wildlife forage and habitat, it does provide an alternate food source for our chickadees in the insects harbored in the knapweed seed-heads. This may be a good thing; however, is this easy food source distracting these important foragers of tree insect pest species from doing their forest protection job? A study from Montana shows that knapweed infestations can suppress seedling establishment of Ponderosa pine (Pinus ponderosa) and interfere with its continued survival (Bedunah, Carpenter 1991). In considering goals to restore our forest tree species composition to historical levels, knapweed poses a risk to success. Although long-term and anecdotal observations of wildlife and habitat degradation abound in the soft or gray literature of managers’ field notes and agency reports, such damage is sparsely documented by quantitative studies (Blossey 2000). Some of the wildlife studies that have been conducted well illustrate the damage so long observed. In Montana, Celestine Duncan’s (1997) work shows that spotted knapweed invasions reduce available elk winter forage between 50-90%. All weeds can cause problems for the native plant communities, even jeopardizing rare and endangered plant species. In Glacier National Park, a spotted knapweed invasion was documented to have caused six native plants to be classified as rare and extirpated seven species previously designated as rare. Weeds pose the risk of permanently altering the native plant communities of Wilderness Areas. The soil ecosphere, an incredibly diverse web of microscopic organisms in relationship with nutrients, plant roots, macro-arthropods and inorganic soil components engaged in incredibly complex nutrient and energy exchanges, provides the basis of life on our planet. Beneficial soil microbes create soil structure and pore spaces allowing for water and air infiltration and plant root penetration as well as perform significant services by breaking down organic pollutants, binding heavy metals into immobile forms, endlessly recycling nutrients, converting them to bioavailable forms for root up-take, and competing with and parasitizing pests and diseases that attack plants. Physical soil disturbances can disrupt these processes and services as well as outright kill the macroscopic beneficial organisms. Mycorrhizal fungi, including both ectomychorrhizae and endomychorrhizae fungus or vesicular-arbuscular mycorrhizae (VAM), colonize roots increasing their efficiency at absorbing nutrients and water, as well as provide protection from root rot fungi and root-feeding nematodes. Trees and shrubs planted or sprouted into soil lacking in one of these organisms will fail to thrive and often eventually die. How does spotted knapweed effect change in the soil ecosphere? If you compare equal sized samples of any local bunchgrass with its root structure, to a spotted knapweed with its root structure, you can see that the root habitat for the organisms of the soil ecosphere offered by the grass is a much greater mass than that offered by the spotted knapweed. A decrease in habitat decreases the number of organisms that the same amount of soil can support. The health of the soil, in structure and life forms, changes, becoming diminished. Two studies from Montana show us more detailed changes to the soil structure and foodweb interactions. Marilyn Marler (1999) conducted studies to show the relationship of the VAM associated with grass roots in areas invaded by spotted knapweed and the VAM associated with its roots. What she found was that the VAM of the spotted knapweed intermingled with the grass VAM and actively stole carbon from the grass community, giving the advantage to the spotted knapweed in greater vigor and plant biomass. What changes does a spotted knapweed infestation bring to water quality and quantity? Dr. Lacey (1989) performed an experiment comparing water run-off from an uninfested bunchgrass covered area and an equal area covered with spotted knapweed. 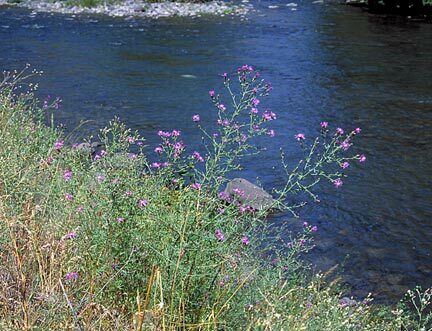 The knapweed infested area produced 56% more water run-off, and 120% more sediment loss. This change leads to higher spring run-offs, resulting in greater stream sedimentation, which reduces water quality and fish habitat. The early high run-off also reduces water retention within the plant community, lowering summer water flows. Lastly, spotted knapweed infestations do not provide a significant vegetative canopy over the soil that native grasses and forbs do, causing reduced moisture retention by exposing the soil between plants to increased evaporation. 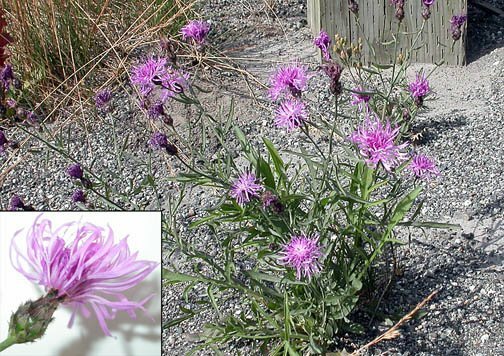 Placing a value judgement on these changes is a human trait, but as I referred to spotted knapweed as a “heinous” noxious weed from the start, I’ve tipped my hand in that debate. 1. Wear gloves as the plant is believed to have allelopathic compounds thought to be carcinogenic in large quantities. 2. Handpulling or digging with a spade works in less dense areas. 3. Repeated spot burning by trained individuals will likely be most effective and efficient. 4. Please don’t use toxic herbicides near our shorelines. Our soils are typically very porous and these will quickly migrate into our waters. In Australia, bushland conservationists team-up with gardeners and nursery associations to protect their natural bushlands from becoming infested with aggressive garden escapees. They call their program, ‘Garden Thugs’ after the garden plants that misbehave, climbing over the garden wall and running rampant over the surrounding natural areas. We suffer the same problem here, in this country, without the benefit of a similar program. We find many of our wildland weed problems rooted in our history of importing plants from afar due to their beauty, medicinal or other useful values. Through our trade and travel practices, we have imported, both intentionally and accidentally, plants that have proved harmful to our natural areas. We are globally homogenizing our plant and animal communities and many areas are losing their unique values. For the most part, imported plants have behaved themselves — or at least have not created a problem — while proving invaluable to us for food, fiber and medicines. Leave it to only a few bad characters to ruin the reputation of imported nursery stock. We call these foreign problem plants, noxious weeds. Purple Loosestrife along a garden pond. When we call a noxious weed foreign or alien, it is not necessarily from another country. It is alien to our eco-region. 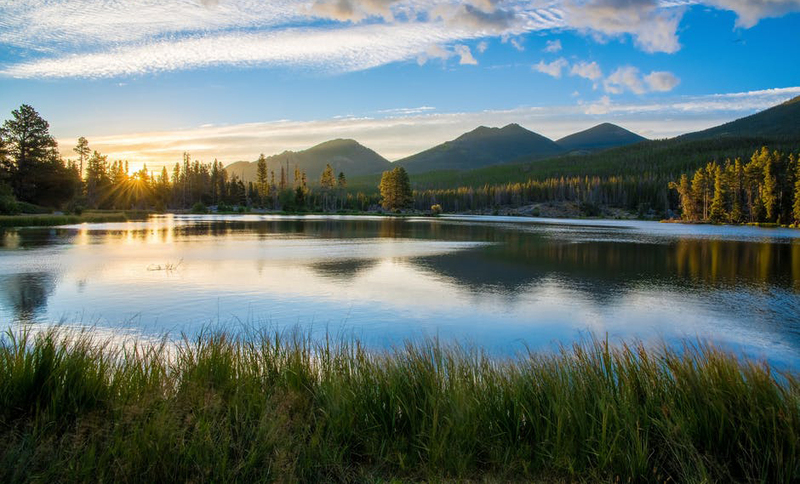 This encompasses a large area, taking in the greater Pacific Northwest and most of the northern Rocky Mountains. In Washington and Idaho, we have laws and regulations to ameliorate the harmful effects of noxious weeds. From these, we are directed to control or at least contain our noxious weeds. This is also why some of the plants we would like to see in our gardens are quarantined from entering or being transported through our states. Our weed laws organize weeds into different categories with specific goals for prioritizing control measures so they are most cost effective. The first priority includes noxious weeds with very few infestations and the goal is eradication. The second priority includes noxious weeds with few infestations in a given area and the goal is also eradication. The last two priorities are noxious weeds with an abundant population in a given region or throughout the state and the goal is containment. 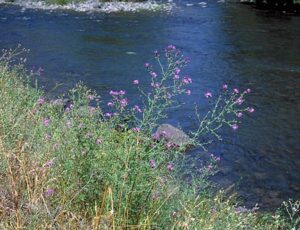 Many of the noxious weed species with limited abundance and distribution as well as all aquatic plants are quarantined in Idaho and Washington. Purple loosestrife, Lythrum salicaria, is an escaped garden ornamental plant that has a propensity for invading wetlands and riparian zones. It is a noxious weed in both states, with limited distribution in our immediate Selkirk ecoregion. It can alter ecosystem processes and functions, especially wildlife habitat. Due to the plants’ tendency to grow as a close colonnade, it forms an effective fence at the waterline. Near shore shallows are unavailable for the amphibians and invertebrates that make up the dietary needs of many of our ducks for brooding and rearing their young. Access to nesting sites and materials is also prevented. Shoreline fishing and water egress or ingress for boating or swimming activities are effectively blocked by a purple loosestrife infestation. …can quickly expand to encompass the entire shoreline, destroying waterfowl habitat and recreational values. 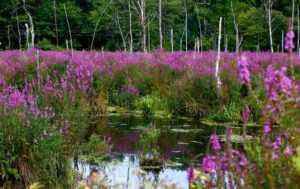 A prolific seed producer (over a million seeds from a large plant), purple loosestrife’s reproductive potential is powerful. Seeds remain viable in the soil for three years, and stems that are cut from the plant and left uncollected can root where they fall or float off to, rapidly expanding a population. 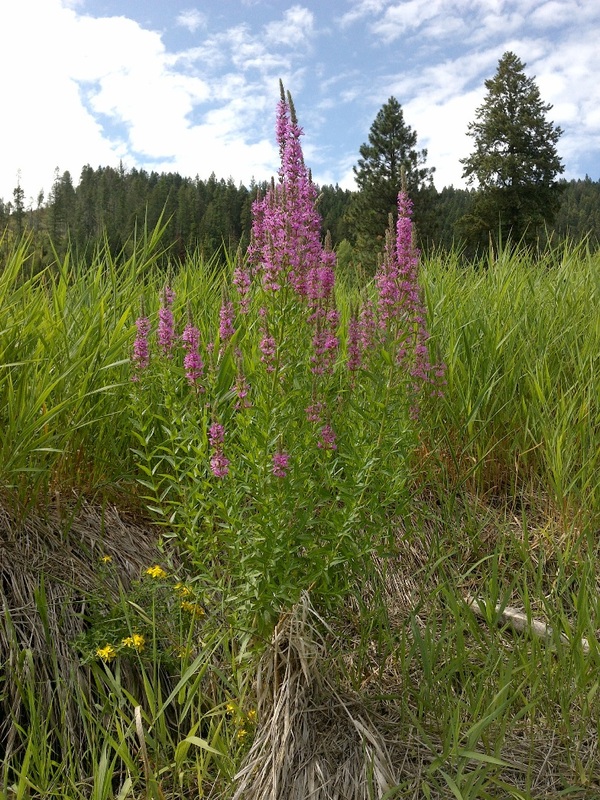 In 2016, a small population of purple loosestrife was found along the Priest Lake shoreline near Coolin. The Bonner County Weed Supervisor released a bio-control agent on the population that is very effective at keeping an infestation contained, but by its nature, cannot ensure eradication. As we plan our gardens and share plants with our friends and neighbors throughout the gardening season, let’s not invite any garden thugs home! 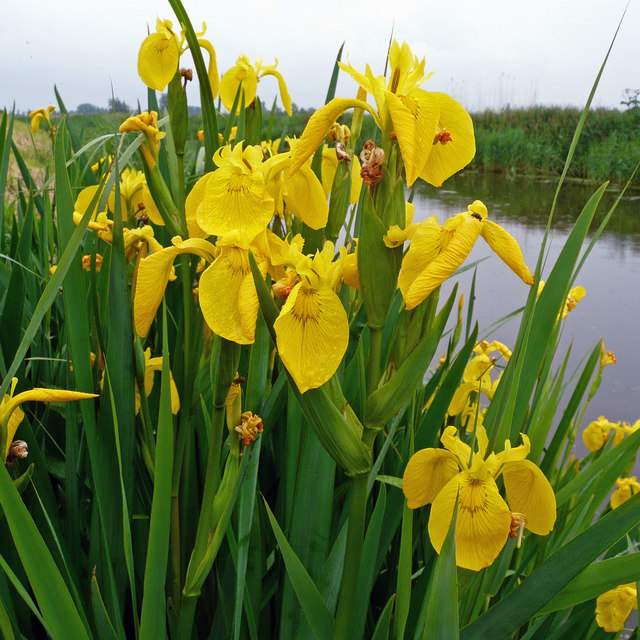 Although a cheerful splash of bright yellow in early spring along our local shorelines, yellow flag iris infestations are quite harmful to many of the values we hold dear for living on the water. Iris infestations reduce waterfowl nesting sites and do not provide materials for building nests. They do not provide cover for hiding from predators and they do not provide structure to support the small invertebrates waterfowl depend upon for raising their chicks. The dense leaves and root system of the iris infestations do not have the structure needed for young fish to forage and hide from predators. Infestations also reduce options for mammals that depend on shoreline habitat, including otters, muskrats, beavers and moose. They also interfere with recreational activities. Landowners who wish to undertake management actions can contact their local weed control authority to obtain the rules and regulations governing such activities. In Pend Oreille County, it is necessary to have the “Blue Book” – “Aquatic Weeds and Fish” on site as it constitutes your County Shoreline and WDFW HPA permit to perform manual management activities. Books are available from the Weed Board office, 227-B S Garden Ave in Newport, 509-447-2402 or noxweedinfo@pendoreille.org. The Washington Department of Natural Resources may require an additional permit or at least permission for installing bottom barriers. 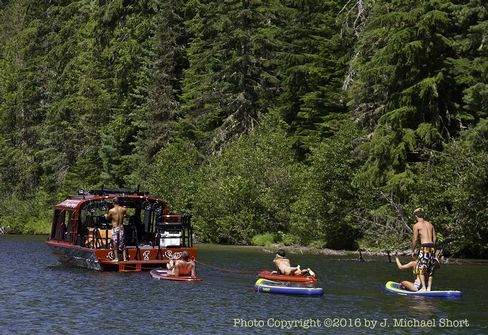 On the Pend Oreille River, the Army Corp of Engineers may also require further permitting or permission. Bonner County currently handles all Yellow Flag Iris infestations directly, and requests that observations be brought to the attention of their Weeds Program (208.255.5681 x 1171). 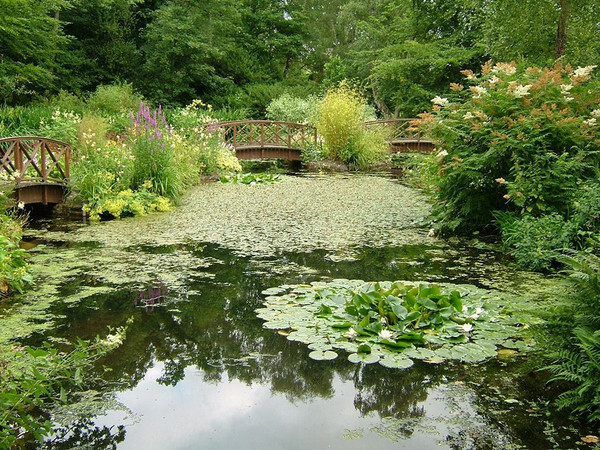 There are several management options including hand-pulling small iris plants or digging out large plants – no easy task. If this option is chosen, sediment screens need to be installed to prevent sediment transport into the waterbody as this would affect water quality. It’s also important to wear gloves for these activities as the sap of this plant is toxic. Bottom barriers, or screens, are another management option. These occlude light, preventing photosynthesis, and also suffocate the plants. The leaf material needs to be mowed before installation to minimize off-gassing as the plant material decays, as the gasses form bubbles that can lift or move the barriers, reducing their efficacy. Due to the damage these barriers also cause to the micro habitat they cover, as a management option, it is only appropriate for small scale projects. 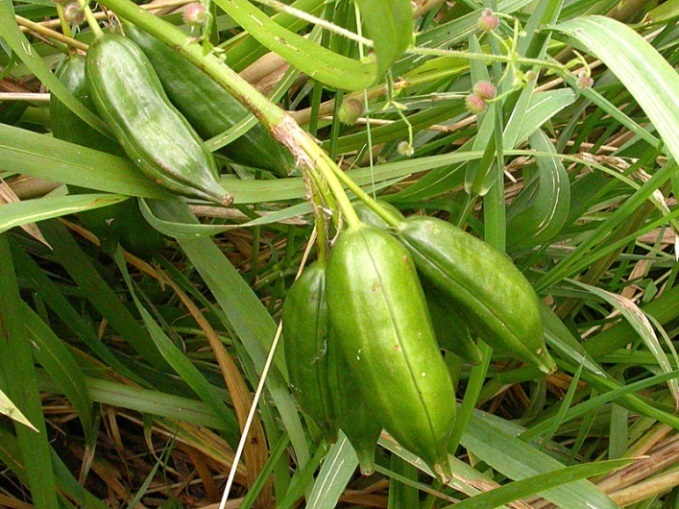 For those who choose to take a more relaxed approach, in late summer, seed pods will be maturing. Landowners can assist in reducing the spread by removing the seed pods and disposing of them on dry land, away from the water’s edge (in burn or compost piles or in the trash). Yellow flag Iris forms large seed pods in late summer. Some people argue that the dense and tightly interlocked root structure helps armor shorelines against the erosive forces of wave action. This is not true for high energy waves as they have the force to tear through the root mass, ripping it off in large chunks that can float to another location and establish a new pioneer infestation. The best defense for shoreline protection is our native willows and especially Spirea – not only is it beautiful with its fluffy bright pink flowers, but the branches that reach into the water dissipate waves to small ripples that do not have the power to damage well vegetated banks.